UTBM offers a high level, 5-year engineering degree course (300 ECTS). The first two years of studies called the foundation level (preparatory cycle) provide not only the scientific and technical skills needed to form a sound basis for engineering training, but also a significant appreciation of human sciences. You can enrol at UTBM at any level throughout the five year program, from your high school diploma (Baccalauréat) onwards. You may also opt for an engineer diploma (Engineering cycle – three-year course). 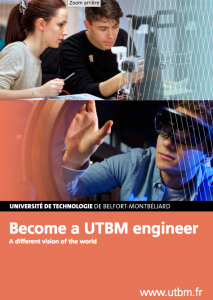 UTBM also offers four different Masters (one professional and three research degrees) and is jointly accredited with the University of Franche-Comté to deliver PhDs. UTBM has set up several different dual diplomas with different universities across the globe. Prepare a dual diploma : Máster en Ingeniería Industrial (EPI Gijón) and diploma in mechanical or industrial or energy engineering. Students from HE Arc can apply for a dual-diploma : Bachelor (HE Arc), then Engineering diploma (UTBM).